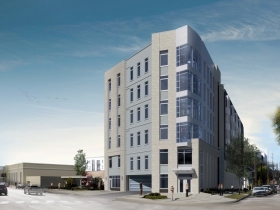 The 155-unit North End Phase IV apartment building. 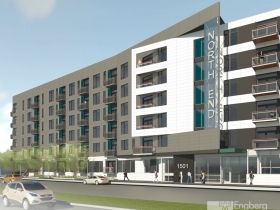 1,449 new rental apartments sounds like a lot, and in case you missed it that’s how many apartments were under construction at the end of May within two miles from City Hall, but there’s more on the way. At yesterday’s meeting of the City Plan Commission two additional projects, with a total of 342 units, moved closer to starting construction. 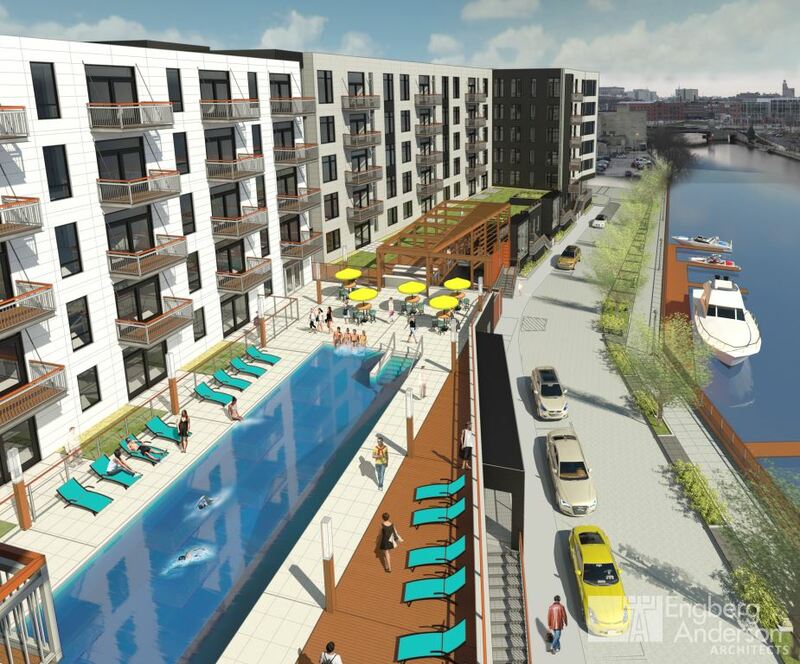 The commission was reviewing the plans for the RiverWalk portion of fourth phase of Mandel Group’s North End development, and a change in the design of Mercy Housing Lakefront’s Greenwich Park Apartments. 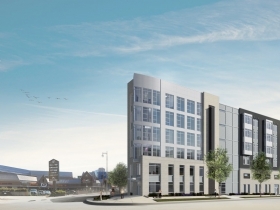 The fourth phase of the North End contains two buildings. 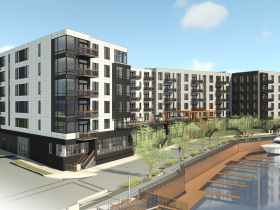 A six-story, 155-unit apartment building, which was part of the discussion during the meeting, that is planned to be built along the Milwaukee River adjacent to the completed North End phase one and phase two and a second six-story, 90-unit building which will be located just across N. Water St. Architect Eric Ponto, of Engberg Anderson, explained that the new RiverWalk section won’t include bio-swales like the existing North End RiverWalk has today, but it will have planting beds to allow for trees to be planted. Other features such as lighting and the choice of materials will be consistent with the existing RiverWalk. 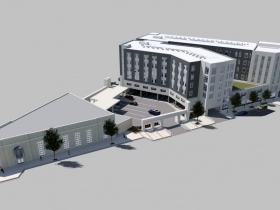 Ponto went on to explain the “street will be activated,” because there will be walkup units on the first-floor which will hide the parking garage. Ald. Nik Kovac, who represents the area the project is located in, spoke briefly, saying, “we’re excited about the public amenity being extended,” referring to the RiverWalk. He then quipped, “I assume there will be public access to the pool,” which drew laughs. 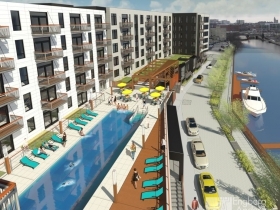 A rarity in Milwaukee, this project includes an outdoor swimming pool which will overlook the Milwaukee River, surely a feature popular with avid-swimmer and Mandel Group CEO Barry Mandel. The RiverWalk design was unanimously approved by the commission. 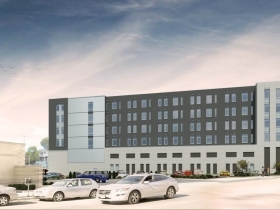 According to a story in the Business Journal by Sean Ryan this $60 million project is expected to break ground this fall. Representatives from the Mercy Housing Lakefront development team also addressed the plan commission. 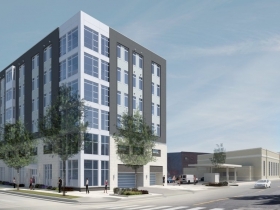 The team was requesting alterations to approved design for the proposed six-story Greenwich Park Apartments, planned for construction on parking lots owned by the city and US Bank and bounded by N. Murray, E. Thomas and N. Farwell. In 2014, the project received affordable tax credits from the Wisconsin Housing and Economic Development Authority. 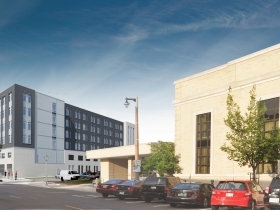 This project has gone through numerous iterations, originally being much taller, but now the first phase, which includes 53 apartments — 45 affordable units and 8 at market rate — appears on track to move forward. This latest alteration was the result of unexpectedly high costs associated with moving electrical poles and two transformers. An initial estimate put the cost of relocating these utilities at about $100,000, but later estimates, due to the transformers, hiked the cost to almost $500,000. Additionally, the soil was more contaminated than initially believed so the decision was made to remove the basement from the project. This resulted in the number of parking spots being reduced from 52 to 44, though zoning only required 38. Due to the higher-than-expected costs, the building will now be wood-frame construction starting on the second floor. This change eliminated the possibility of using the planned curtain-wall system, limiting the amount of glass used on the structure’s exterior. 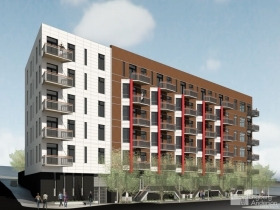 The second phase of the project will include up to 44 more apartments, but isn’t expected to start construction until the first phase is completed. The changes were unanimously approved by the commission. Last week a new plan to “Save the Bucks” was announced and apparently it is “Cheaper to Keep Them.” If you haven’t heard the state, city, Wisconsin Center District, and tax delinquent residents of Milwaukee County (the county), came together and announced a financing plan for the Milwaukee Bucks’ new arena. Adding the Wisconsin Center District to the funding plan allowed a significantly smaller contribution from the state than the $220 million Gov. Scott Walker had proposed. But the deal likely kills any Convention Center expansion in the near future as it assigns a $93 million cost to the district ($200 million with interest costs included). “I don’t understand where the money is going to come from in the Wisconsin Center District’s current stream of income,” district board chairman Frank Gimbel told Ryan, of the Business Journal. From the state’s point of view it might have been “cheaper to keep them,” but it doesn’t look so cheap for the center district. -Down in Walker’s Point a construction fence went up on the site between S. 1st and S. 2nd streets on the northside of W. Washington Ave., and some excavation has started on the site of a 120-unit apartment building being developed by Tim Gokhman, of New Land Enterprises, Jim Wiechmann, of Wiechmann Enterprises of Milwaukee, and Michael Sanfelippo, who owns the property. That would add another 120 units to our total. And in case you missed it, we featured the third phase of the North End in last week’s Friday Photos.